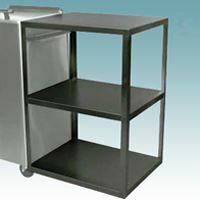 Stainless Steel Side Rack Table (21" W x 16" D x 27" H) For heating units. Ideal for storing towels, steam pack covers and spare packs. Made of stainless steel. The Side Rack Table can be used with ERP2780, ERP2790 and ERP2800.